BACKGROUND: Diffuse knapweed is a native of Eurasia, coming to the U.S. in the early 1900s. It spreads by seed, aided by the tumbling of windblown mature plants, and it grows under a wide range of conditions. DESCRIPTION: Diffuse knapweed is an annual, biennial, or short-lived perennial that can grow to a height of 3 feet, with a single, much-branched stem that gives the plant a bushy appearance. Basal leaves are pinnately divided and up to 6 inches long; stem leaves are entire and smaller. Tips of each branch have a 1/3-inch wide, white, or sometimes pinkish flower head that appears from midsummer to fall. Bracts surrounding the flower are yellowish green with a light brown, comblike margin. The upper part of each bract narrows into a short, stiff spine. Seeds are brown to gray in color and are tipped by plumes that fall off at maturity. 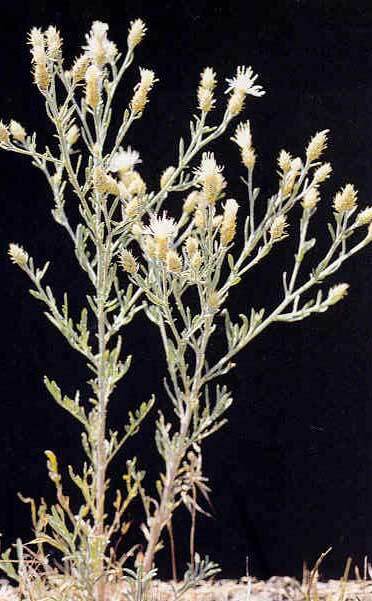 DISTRIBUTION: Diffuse knapweed is widespread in the Northwest and in many other states. CONTROL: Biological control agents include 2 seed head gall flies and a root boring beetle, which have been effective. Herbicides are available for control.